The new stockholding will complement the company’s current extensive Liebherr service exchange stock which includes various-sized hydraulic cylinders from leading brands such as CAT, Komatsu, Volvo and Hitachi that have long proven their success in Africa’s earthmoving, drilling and surface mining operations. 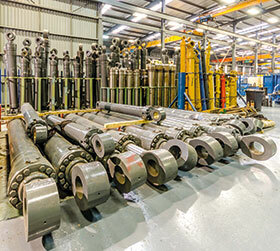 Hytec Engineering ensures the operational efficiency of all second hand and refurbished cylinders by adhering to strict OEM standards through its CAD facility, reverse engineering services as well as its specifically designed cylinder test bench that tests stroke sizing and leak detection on every cylinder. “Every component is inspected and tested upon arrival at our factory,” adds Goosen. “We also monitor the amount of times we reuse a component before scrapping it to ensure that no cylinder is at the risk of material fatigue.” Once a cylinder has been tested, the automated system generates a certificate that can be used for quality control by clients.